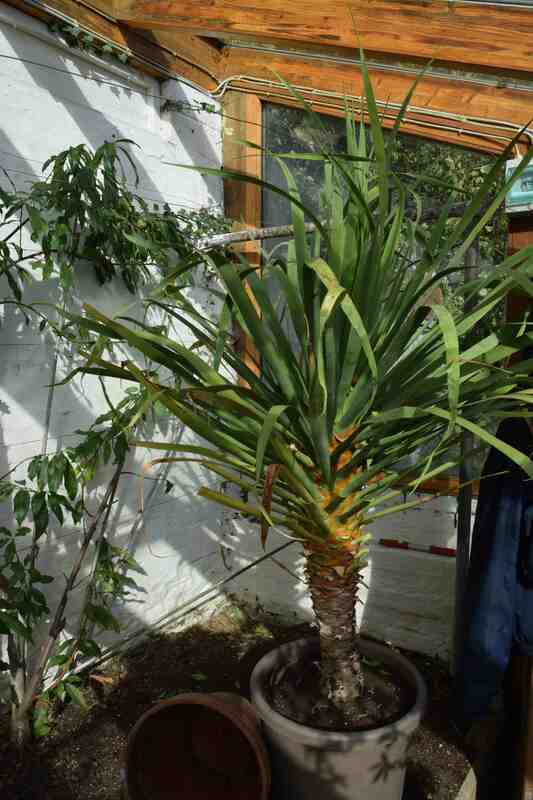 My dragon tree (Dracaena draco) is about 15 years old, I am not exactly sure of its age now and I am very attached to it. I had one many years ago and was pleased to see, when I visited Myddelton House earlier in the year, that it was still growing away well in the new greenhouse there. The one I have now was not left behind like that one and made the trip in the removal van on the hottest day of the year and was in need of a repot. 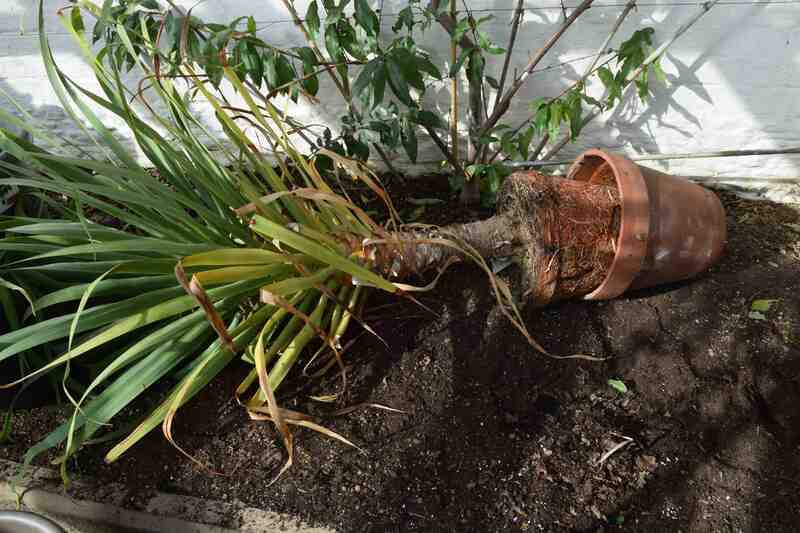 The pot was packed with roots – obvious because it had made some looping roots above soil level. These plants also increase their stem girth as they grow so the trunk at ground level can be thinner than higher up. This is characteristic of monocotyledons which do not have the ‘usual’ ability to make secondary stem thickening and many have stilt roots that help support the mature plant. It took a while to extricate the plant from its pot. In fact I tried to repot it several months ago and have up. But with the plant on its side I carefully levered a trowel around the edge, then gave up. Then I tried again. And finally I succeeded in getting it out. It is not really the perfect time to repot the plant because there is a danger that the ’empty’ compost will remain wet in winter but needs must. I will just have to water carefully for a while. Then I hope it will be growing strongly when it has its final move into the new conservatory in a year or so. Wow! You have a dragon tree! Impressive! Hope it does well in its new home – though if it grows as in Tenerife, you’ll need a bigger conservatory. But that’s years away! I don’t think I need worry too much – the conservatory is about 5m high so it won’t bust the roof in my lifetime.